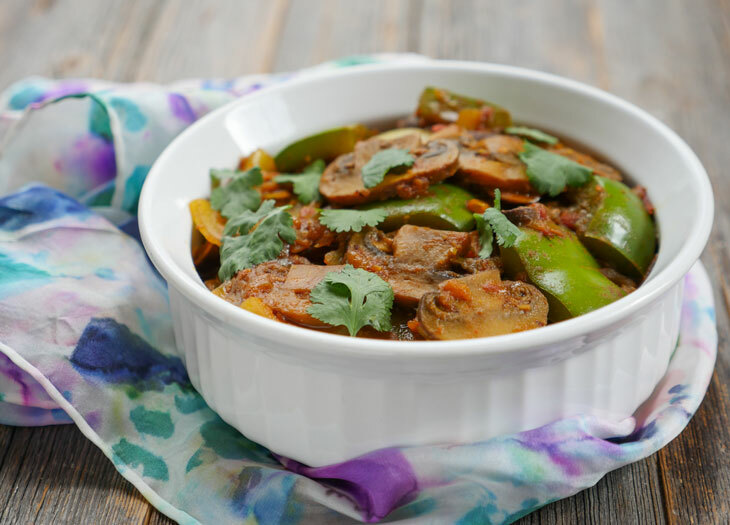 This Mushroom Do Pyaza is a delicious “dry curry” that calls for mushrooms (of course) and caramelized onions. The name of this dish “mushroom do pyaza” actually translates to mushrooms with double the onions! 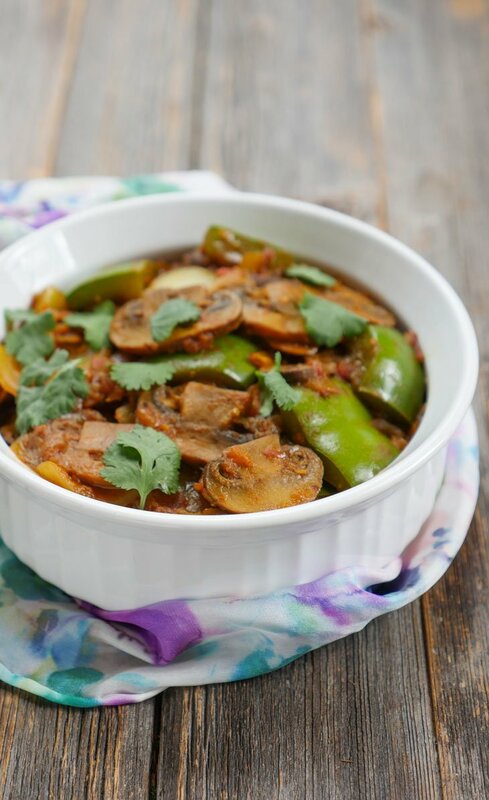 I love how easy it is to make this Indian style mushroom dish in the Instant Pot! Do Pyaza means “two onions,” and so if you see these words in the name of a dish, then you can expect there to be plenty of onions in the recipe. Not only does this recipe call for lots of onions, it also calls for preparing the onions two different ways: caramelizing the onions and stir-frying them. This recipe calls for just TWO tablespoons of water. Yup, that’s right. Not a typo, folks. All of my recipes are tested (many times) using my 6 quart instant pot, so trust me – this will work for ya. Let me explain: the two tomatoes in the recipe will add liquid and the mushrooms themselves will also release liquid while under pressure. You don’t want to add too much additional water, otherwise you’ll end up with a curry rather than a dry-ish dish, as this is meant to be. I’ve been on a “dry” veggie kick lately – sharing Indian vegetable recipes that are more like sautéed type of dishes rather than curries. Don’t get me wrong, there’s a time and place for veggie korma – but for everyday meals, it’s nice to eat vegetables that aren’t absolutely drowning in curry. You want a little sauce – just enough masala to perfectly coat the veggies without suffocating them. If you’re looking for more dry vegetable recipes, try my cabbage peas sabzi, arbi or aloo gobi just to name a few. You can check out all of my Indian IP recipes here. Do Pyaza means “two onions,” and so if you see these words in the name of a dish, then you can expect there to be plenty of onions in the recipe. Not only does this recipe call for lots of onions, it also calls for preparing the onions two different ways: caramelizing the onions and stir-frying them. If you love mushrooms and onions, you will love this dish! Press the sauté button, add the oil and allow it to heat up for a minute. Add the diced onions and stir-fry for 8-10 minutes, or until they begin to brown. Add the garlic and ginger, stir, then add the tomatoes and cook for 4-5 minutes, or until they break down. Add the mushrooms and spices and mix well. Add the water, mix well, then secure the lid, close the pressure valve and cook for 5 minutes at high pressure. Add the bell pepper and onion to the pot, press the sauté button, and stir-fry for 5 minutes, or until the onion and bell pepper have softened. *Roasted cumin powder is highly aromatic and has a more intense flavor than regular (unroasted) cumin. Do not substitute this with regular cumin as you won’t get the right favor. Ashley…when you say close valve and cook at high pressure. Doses this mean still under sauté mode. Hi Susan, no you’ll need to switch to either the “manual” button or the “pressure cook” button depending on the model you have and then adjust the cook time. Hope that helps! Can we use the onion masala paste?